I suppose I have come by the predilection for thrift in a fairly straightforward way – I inherited it. There are things that because my parents didn't do them, I never actually have or would in the foreseeable future. Like purchase an entirely new automobile. Do you know how much it depreciates, as soon as you drive it off the lot? I can hear Dad lecturing me, even now. At least two years old, lightly used, dealer warranty. I guess the first overarching principle is – don't fear second-hand! Second hand is cool, quirky and devastatingly original! It wasn't made in China – it may even have been made in America! It is even ecologically sound, if that floats your boat. Best of all – it's cheap. There are things that it is just more sensible to buy second hand: books, for instance. DVDs. Clothing – lightly worn, clean and good quality, of course. Older, vintage items might even be better quality for the same price as something brand new – but cheap. The same goes for shoes, but extra emphasis on the lightly-worn. Accessories and decorative elements, jewelry – say, what do you call second-hand jewelry which has been around for a while? Vintage, if not actually antique. 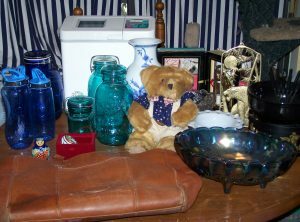 China, pottery, and glassware; you'd be blown away by the quality and good value of items available at estate sales, garage sales and thrift stores. Speaking of antiques, that's another good second hand purchase: good solid wood furniture. Something made twenty, thirty years ago, of solid wood with a little wear and tear on it will still be something more solid, more worthwhile, elegant, and possibly even more interesting that a something made last week from a slab of glued and compressed sawdust covered with cheap veneer. Consider this, also – that solid piece of good wood furniture is already broken in! Second-hand upholstered furniture is something I am in two minds about – considering that liquids (including human and animal bodily fluids – yuck!) might have been spilled into it, all kinds of microscopic and larger vermin might have made a happy home therein over the years that it has been in use. Basically, unless it can be dry-cleaned, or run through an ultra-hot washing machine cycle with bleach, I'd give it a miss. . . . this applies to pillows, too. And mattresses. I might be budget-minded, but I am also fastidious. Generally, these last fall into the category of things one should go ahead and purchase new, but your mileage and your skills at upholstery may vary.